Getting ready to install spray foam for your next project? Well before you even pick up the applicator gun, you need to focus on preparation and safety. These five essential tips will keep you safe and productive during your insulation installation. In addition a pair of high quality safety goggles (not just safety glasses) are required to protect the eyes from exposure to air-born particles. Spray Foam insulation is an aerosol that is designed to expand and designed to STICK! Remember, none of your skin should be showing when you install foam insulation. You should always wear disposable coveralls to ensure no product touches the skin. Even if you can’t see it, the mist from the spray gets into the air, so you should never skimp on your protective clothing. Whenever you can, use coveralls that come with an attached hood. 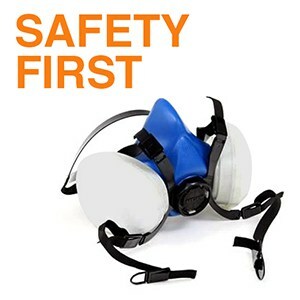 Simply wearing the required safety goggles and respirator would leave parts of your face and head exposed. A hood helps keep those areas protected. Ideally, you should have no skin showing at all. Pro Tip: Disposable, surgical style gloves work great, but here’s a tip from the pros: Tape your gloves to your sleeves. It will keep everything in place and ensure no foam comes into contact with your wrists and arms. Make sure anyone who is not wearing proper protection (as outlined above) has vacated the building before you begin to spray product. It doesn’t matter if you think they’re far enough away from where you’re working. The only safe place when spraying is out of the house or building. Always use Tiger Foam Insulation™ products in well ventilated areas. If the jobsite is not ventilated, we recommend adding mechanical ventilation, or wearing a powered air purifying respirator (PAPR). Cover or tape any outlets or other exposed surfaces such as molding or trim, as the foam is very difficult to remove from unwanted areas. Pro-tip: Make sure none of the surfaces you’ll be spraying are wet. It’s never a good idea to spray on wet surfaces. If a surface has a moisture rating higher than 20%, you should not apply spray foam as it will not adhere properly to wet surfaces. If you don’t already have a moisture meter, consider getting one and making it a part of your toolset. When you know the workplace is properly prepared and everyone else is off the site, you can start to apply the insulation. This plan doesn’t just relate to you, it’s important for your clients as well. You should be able to tell your clients when it’s safe for them to re-occupy their home. Or, if you know other workers need to get into the house after you’ve finished insulating, you need to tell them when it’s safe to re-enter the house. The standard time recommended by the EPA is 24 hours for unprotected workers to re-enter the area. For the final step you should always test the foam before you put it on the walls. Make sure your tanks are the correct temperature (75-85F) Point the gun into an empty box or bag and give it a spray to make sure all the chemicals are coming out evenly and the foam is expanding properly. Remember, every time you stop spraying for more than 30 seconds, you’ll have to change the tip. When you aren’t spraying, the foam will gather in the tip and clog it. So make sure you know how and where you’re going to spray before you get started. When it comes time to spray the foam insulation, don’t just fill a wall cavity completely. If you do this, you may not get the best results. Instead, spray the edges of the wall cavity with a 1/2 inch layer of foam. This layer will expand to an inch of foam, creating what’s called a lift. By creating lifts, you’re letting the foam fill any space between the studs and the sheathing. This also keeps the sheathing right where it should be. If you spray foam insulation into a gap between the studs and the sheathing then cover that layer of foam with more insulation right away, you can actually knock sheathing that isn’t properly secured out of place. As the foam expands, it creates pressure that can actually push or warp the sheathing. That’s why you should always start by spraying the edges and go back to fill in the center of the wall later. If you need to add more layers to insulation you have already applied, make sure you wait several minutes for the applied foam to cure. Spraying more foam onto uncured foam will reduce the insulations R-value. The same thing can happen if you create a lift that’s too thick. Never apply a lift more than 2 inches thick. Never apply spray foam insulation without the right safety gear. Before you start to spray, always double check that your work environment is prepared and anyone not wearing protective gear is out of the house. Always make sure you have a plan before you start. In depth environmental and safety data for all of our products is available on our Safety Data Sheet page. Links to each products info are also provided on every product page. Always using our products in a safe and responsible manner will help you achieve superior results. Not sure what type of spray insulation you should use? Take a look at our complete product line or contact us anytime for info, tips and pro advice.